It was a quiet Sunday evening and my husband and I were winding down for the night to go to bed. We had contemplated going out to see a movie at the theater but decided against it. In hindsight, I am relieved we made that decision. That's because my water broke that night. It was March 17th, the day after my birthday. I was 36 weeks pregnant with my first child, who wasn't due until tax day. I had left work that Friday ready to celebrate my birthday at home and enjoy the time that I had left with just my husband and me. Instead, I got a birthday surprise- my beautiful son was born. That was the best gift I could have received. What breaks my heart is that to many people, my son could have been aborted because he wasn't considered fully human yet. Even though he was born a month early, he was completely healthy. He had two hands, two feet, a beating heart and everything else that a healthy human has. The thing is, he had all of those things long before 36 weeks, which was evident when viewing the ultrasounds during my pregnancy. We were able to capture some amazing photos and videos of my son in utero. My favorite is the video of when we caught him yawning. I remember the first time we were able to hear his little heart beating. Even though he looked like a little alien peanut, he was a living, growing person inside of me. As my pregnancy went on, I felt those flutters in my womb, which progressed into kicks and jabs to the ribs. To say that my son was not a human at that time is a heartbreaking (and inaccurate) statement. He became human the moment he was conceived. Science will confirm this. Maybe he didn't have a fully functioning brain, or a full head of hair (yet), or the ability to breathe on his own. But you know what? All of us are born lacking a few things. Knee caps. Teeth. Clear vision. The ability to laugh, smile or process information. And yet we never question if those who are born full term are "human." At the moment of conception, our entire DNA is determined. Our hair color, eye color, gender, everything. Our genetic blueprint is laid out long before our physical bodies start developing. 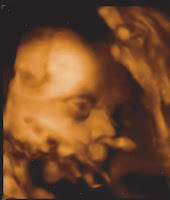 I remember one picture we captured during my son's 3D ultrasound. He was about 30 weeks developed and he had opened one of his eyes. Do humans not have eyes? Maybe he couldn't see fully yet but he was fully alive. Abortion stops a beating heart. You may have heard this before. That's because it's true. By the time a woman finds out she is pregnant, her child already has a beating heart. And developing organs like the spinal cord, liver and lungs. How we can justify the destruction of the child in the womb is unfathomable. It's been four months since my son was born, and he's as healthy and precious as ever. He smiles all the time, he has started vocalizing and just days ago, he rolled over all by himself for the first time. Looking into his big blue eyes reminds me of when I saw those eyes on the ultrasound screen. I didn't know at the time who that little person was inside of me, but now that I know, I can say with certainty that he is just as human now as he was then. As one who was born 3 months early, I wholly agree with this view. The logic that leads a person to abort and call the life within "not human" is tragically flawed. I was also born three months early and I have always been anti-abortion as a result. For me it has nothing to do with religion. Abortion is wrong because it is the taking of a human life. Was I not human at 25 weeks old? I was born at 26 weeks. At what point did I become human?